Home > News & Events > Latest News > News > Inner Wheel Club of Rushden raises £9k! Inner Wheel Club of Rushden raises £9k! This week we were delighted to be presented with a cheque for £9,000 from the Inner Wheel Club of Rushden. Jennifer Norman, Club President, selected NAB as her local beneficiary for the year after members of her own family and also fellow club members had received support and services from NAB. The local ladies group, made up of 25 members, managed to raise the impressive sum of £9k by organising a Charity Dinner and Auction at the Scott Bader Community Hall in Wollaston on 29th April. The Club even managed to get celebrity Charlie Ross of “Flog it” fame to act as auctioneer, freely donating his time, entertaining an audience of 170 guests. Charlie had 13 items to sell, the top draw in the auction was an oil painting by renowned artist Jeremy Barlow which raised over £1,000, plus Charlie even sold his own tie for £50 to boast funds. Alongside the main auction on the night there was also a separate silent auction and a sell-out raffle. “President Jennifer Norman and her team worked tirelessly for over 6 months, planning everything, seeking donations and support from family members, friends, other clubs and local businesses. When the ladies said they would fundraise for us we never imagined they would raise so much – it is testament to their hard work and the success of the night that they are able to present us with this amazing cheque for £9,000! 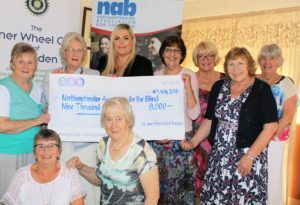 NAB would like to Thank everyone who was involved, donated and supported the Inner Wheel Club of Rushden to achieve this –Well Done. The funds raised will go towards ensuring our Community Services continue to support blind and partially sighted people living in Northamptonshire”.